Some recipes are so simple that it seems hard to believe that they are so good. When I first moved to London, I was very excited to kneel at the snout-to-tail alter that is Fergus Henderson's St. John. I ordered Welsh rarebit, liver, and of course the famous bone marrow. It was not a light evening to say the least, but deeply satisfying. It is the unique genius of Fergus Henderson that a humble side-dish actually stole the show. The bone marrow was served with a side of bright green parsley leaves, tossed with vinegary shallots and capers. The bone marrow was wonderful, but it was the parsley salad that I couldn't forget. After that experience, I started noticing that other cooks shared my sentiments. Tamar Adler dedicated a page to the same parsley salad in her excellent book An Everlasting Meal, and Queen Nigella Lawson mentions it one of her wonderful cookbooks How to Eat. Parsley is normally an afterthought, an augmentation, or a light garnish for color. Having parsley as the main ingredient somehow feels both deeply traditional and revolutionary. I love the flavor of flat leaf parsley, it's very fresh and stands up well to the intense acidity of the vinegary shallots and pickled capers. I recommend slicing the shallots thinly and soaking them in vinegar with a little bit of salt for at least 30 minutes before tossing with the parsley. You could soak the shallots for up to two hours, or even use proper pickled shallots. This salad is more-ish, so I would say that a half bunch of parsley per person would be a good amount. So plan on two bunches of roughly chopped parsley leaves. Added bonus, it keeps very well in the fridge, and is delightful over a fried egg for brekkies. Finely slice the shallots and soak in the apple cider vinegar for 30 minutes to 2 hours. 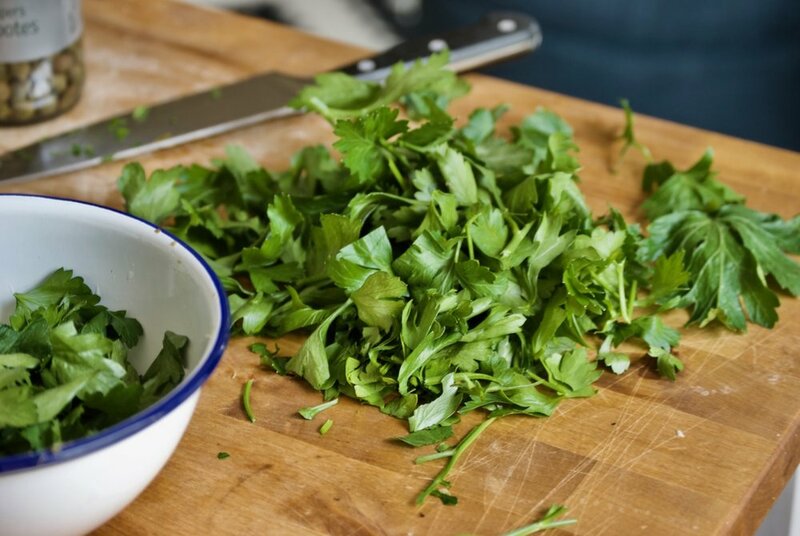 Wash the parsley and dry it very well in a salad spinner. Pick all the leaves off the stems, (a job best done in front of an episode of Downton Abbey.) Roughly chop the parsley but keep the many of the leaves whole. Toss the shallots with the parsley, chopped capers, and oil. Season with salt and pepper to taste. 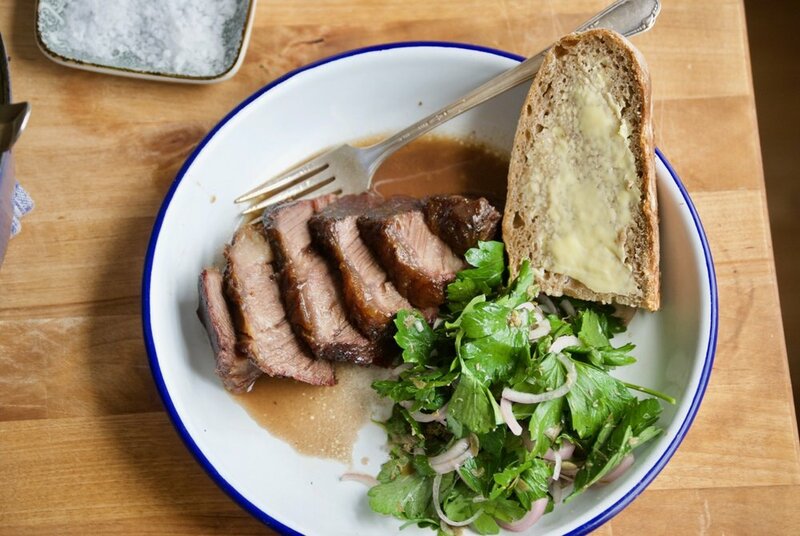 Serve next to steak, marrow, ribs, or a roast.